The Nottingham YMCA has been serving the city since 1871 and has just set up a 140th Anniversary website. I fenced at the YMCA in the 1970s, so I uploaded a short article and photograph to the site (no longer there). Having moved to Nottingham in 1974 to work, I took up fencing the following year at night school and fenced at the YMCA fencing club between 1976 and sometime around 1981. I would never have made a great fencer, but really enjoyed the sport and the great group of people in the club at the time. The social side of the club was brilliant; we fenced at other local clubs and in competitions and held quite a few social events and trips. Normally the fencing took place on Friday evenings and we usually went over to The Dolphin pub on North Church Street for a drink afterwards. The Dolphin is no longer there, having been demolished to make way for shops and a car park. 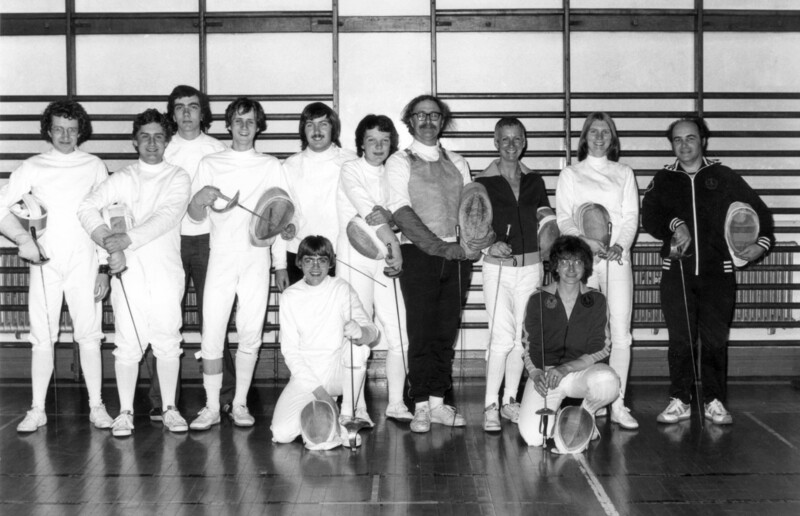 Geoff Dawson was our fencing coach during this period; Geoff is shown (with glasses and moustache) in the centre of this photograph of twelve of the club members, taken in June 1979. Memories of the club are particularly poignant for me, as I met my wonderful partner and wife Sue there. Sue is next to Geoff Dawson in the photograph, with her hand on her elbow. I’m standing on the far left of the picture (curly hair and glasses) having just dashed back to the line up after setting the camera’s shutter delay. How much do you charge for fencing and your coaching classes last for how many hours? I want to know about fencing coaching classes. My name is Geoff Dawson too. I am one of Geoff’s 4 sons. Great to see this picture. I’m 57 now but do remember dad fencing and the Dolphin etc. Thanks for your comment. We had a great time fencing, learning to fence and socialising with your dad; he was quite a character.